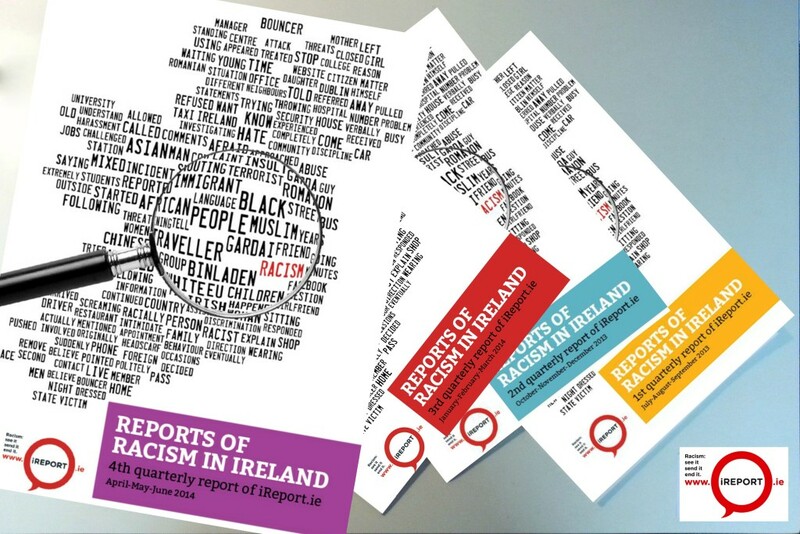 4th Quarterly Report of Racism in Ireland Published. Click here to read it. This latest Quarterly data report, the fourth since its launch in July 2013, covers the period from April to June 2014 and is testament to iReport.ie’s reliability, showing figures which are remarkably consistent with previous quarters. An incident reporting rate of more than 1 a day over the year has established the quarterly figure of close to 100 as a near-constant, giving the annual figure of over 400 incidents reported in the first 12 months of iReport.ie. 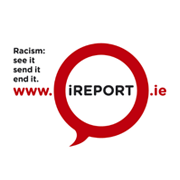 A closer examination of the data in respect to the backgrounds of people being subjected to racism, shows that iReport.ie continues to tell us reliably that racism is experienced every day, and by a wide range of groups in Irish society. 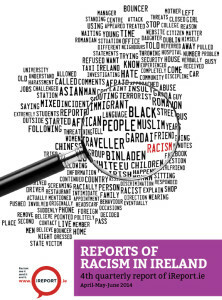 While in this quarter reporting rates to iReport.ie are highest from people reporting racism against Travellers, perhaps reflecting a redoubling of efforts by Traveller organisations to record incidents reported to them, in previous quarters it was reports of incidents against people of Black or of African descent that were highest. Irrespective of this variation, the information clearly shows that people from across almost the full range of minorities in Ireland are consistently reporting unacceptably high rates of racism. In this Quarterly, an increase in reports of incidents targeting Jewish people reminds us that antisemitism is sadly as real in Ireland as it is in other parts of the world. This dubious honour also holds for incidents perpetrated against Roma and against Muslims, just as it does against Asians and migrants from central and eastern Europe. No racialised group is exempt from the widespread racism that people experience in Ireland. This is the reality which Irish Society and its institutions must face. However, we do not have data concerning all groups. As with the previous Quarterly, reports from people who are awaiting their asylum applications in the increasingly unacceptable regime of Direct Provision Centres are completely absent from this data. If it is a lack of confidence in society’s procedures for addressing its ills that prevents most Roma, Muslims, Jews, Black Africans, Asians, Travellers and European migrants from reporting, whether to statutory authorities or to iReport.ie; for the people living their lives out in the bleak oblivion that is the Direct Provision regime, there is no confidence to report incidents whatsoever. This degrading and inhuman system for holding people who have fled prosecution must end without delay. Whereas Irish and international studies consistently show that a key factor leading to under reporting is a lack of confidence in the police’s ability to respond appropriately to racism, worryingly there has been little or no improvement in reported Garda responses. As might be expected from other studies on under-reporting, just 18 out of 105 respondents said that they reported the incident to Gardaí. Of these 18 only 2 reported a positive response, 13 gave negative responses and 3 were neutral. Under “negative”, respondents cited “racist language by Gardaí, delays in responding to the incident or taking a statement, failure to follow up the incident, or a failure to provide crime numbers”. When it comes to serious crime, alarmingly only 3 of the 13 assault cases reported to iReport.ie were also reported to Gardaí. Clearly, much more must be done to establish the confidence of communities in the State’s willingness to address racism. Attempts to directly compare these figures with the State’s own figures on racist crime - just 41 in the first six months of 2014 – should be treated with caution. Firstly the Department of Justice’s Office for the Promotion of Migrant Integration (OPMI), the body which publishes these figures, does not count incidents perpetrated against Travellers, who are considered outside of the OPMI’s remit, a practice justified as reflecting the State’s long discredited and outdated policy of failing to recognise Traveller ethnicity. Secondly there is no reliable systematic way of recording racist incidents and tracking them through the criminal justice system. If these figures were taken at face value, then Ireland has a very low racist incident rate indeed, much lower than all of the surveys and iReport.ie suggests. This situation must be remedied, and the state conform to its European and international obligations by bringing in the systematic logging, tracking and monitoring of racist incidents, starting with An Garda Siochana’s own crime recording system upwards. Lastly, iReport.ie presents data reflecting the full spectrum of racist incidents, whether or not an incident might be considered to constitute a crime. The State’s data is concerned only with that which it has established constitutes a crime. To enable easier comparability, ENAR Ireland, following consultation with the OSCE’s Office for Democratic Institutions and Human Rights (ODIHR), is revising both its monitoring questionnaire and reporting format. The new format, starting in 2015, will facilitate direct comparison, not just between the results of iReport.ie and those of the OPMI, but between these figures and the equivalent figures pertaining to other European states. In so doing, iReport.ie is establishing monitoring standards not just in Ireland, but across Europe as well.